This little loop hike to Baxter Mountain in Keene, NY is well worth the trouble it takes to find it. The alternative is to take the more popular trail from Route 9N starting at Spruce Hill. Both routes are nice. 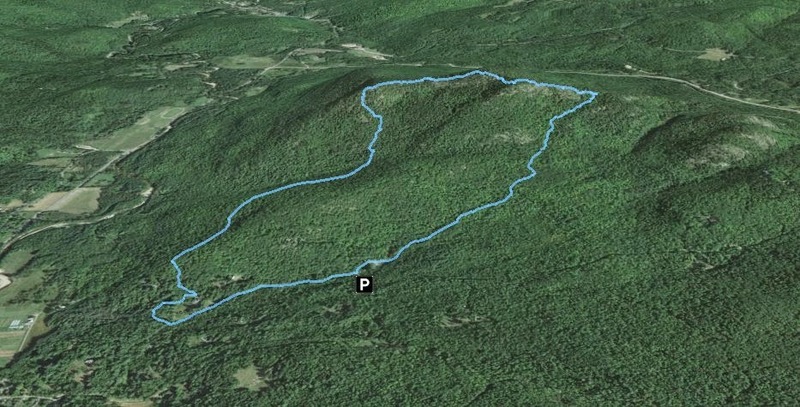 The trail from Route 9N is 1.1 miles long and provides quick access to the summit view with an out and back hike. If you prefer a little bit longer loop hike, you can go in search of the trail from Beede Farm to Upham Road. From the heart of Keene Valley, go north less than one mile to a right on Beede Road. Follow Beede as it climbs and winds. You'll go past Upham Road in 0.6 miles. At 1.1 miles, turn right on Stagecoach Road and immediately on the left is a small parking spot for one or two cars. This is the parking place. There is a small sign (pictured below). The sign guidance isn't too obvious. It appears that you duck into the woods at that spot to head for Baxter, but this isn't the case. You have two choices: you can walk down the hill back to Upham Road and search for the trailhead (you won't find it), or you can walk a few feet back to Beede Road, turn right and walk up the hill past an old farmhouse (Beede Farm) and follow two signs guiding you to the trail. This is what we did. By doing the loop counter-clockwise, you can find your way to where the trail ends at Upham Road, an then walk the short distance back up Beede Road to your car. The first sign at the "Beede Farm"
Starting at Beede Farm, two small signs direct hikers across a field between two private homes. Once across the field, red trail markers follow an old woods road. Partway up the old woods road you come a State Land sign. This is the boundary for the forest preserve parcel that includes Baxter Mountain as well as Round Top slightly to the east. The state parcel is part of the Hammond Ponds Wild Forest. On the left is a rock face which is the east flank of Oak Hill, which this loop encircles. Round Top, which could be seen in the distance on the right, will be the subject of a future bushwhack hike. Next the trail rises steeply to the junction with the blue trail which comes from Route 9N. 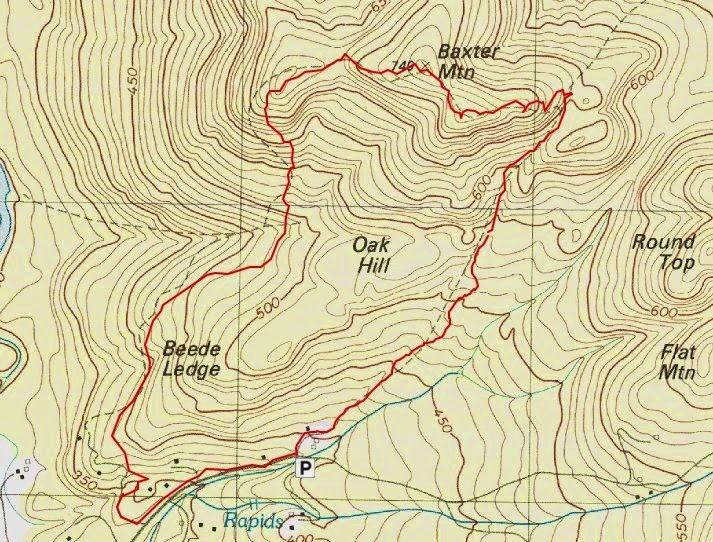 To continue on the loop, you turn left to follow the blue trail to the summit of Baxter. 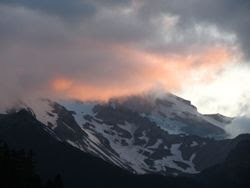 I've only been to Baxter on cloudy days, but there are impressive sweeping views looking north. At the summit, the blue trail joins the yellow trail, which is the trail to Upham Road. There are two very worn signs at this location. It took us a couple minutes to figure out what they said. The top sign says "Upham Road Keene Valley (Trail little used requires care to follow)" and there is an arrow pointing in the direction of the yellow markers . The other sign pointed in the direction we had just come, and it said " Route 9N Keene Valley Beede Farm", referring to the blue trail to Route 9N or the red trail to Beede Farm. These signs have completed their life sycle! As expected, the yellow trail had no snowshoe tracks to follow, but their was an adequate number of old and new yellow markers to guide the way. Leesa and I both really liked the woods throughout this trail. It was very rugged and steep, but impressive forest and rock formations. We were both amazed at how quickly the snowpack has shrunk in this area. Leesa took off her snowshoes and wore microspikes so she wouldn't catch her snowshoes on the rocks and branches on the ground. About 2/3 of the way down, we once again left the state land and continued to follow the marked trail across private land. Near the bottom, the trail takes a sharp left to avoid a home. The last sign on the trail was a sign for Beede Ledges. This appeared to be a herd path leading up a spine towards Oak Hill. We did not follow it at this time, but curiosity will bring us back. Beyond the Beede Ledges sign, a few more yellow discs directed the path between two homes. A green colored home was on the right, with the remains of an old foundation in close proximity to the marked trail. The markers ceased at this point and after a couple hundred yards, we ended up in the driveway of a beautiful old yellow home with green shutters and a fantastic columned porch. We went past a driveway gate with a sign that said "Definitely a Private Drive" and then we were on Upham Road and out to Beede Road. We turned left and climbed the short distance on Beede Road back to the car. We could see the yellow home from Beede Road and there was a sign that said "The Runway" in front of the house. 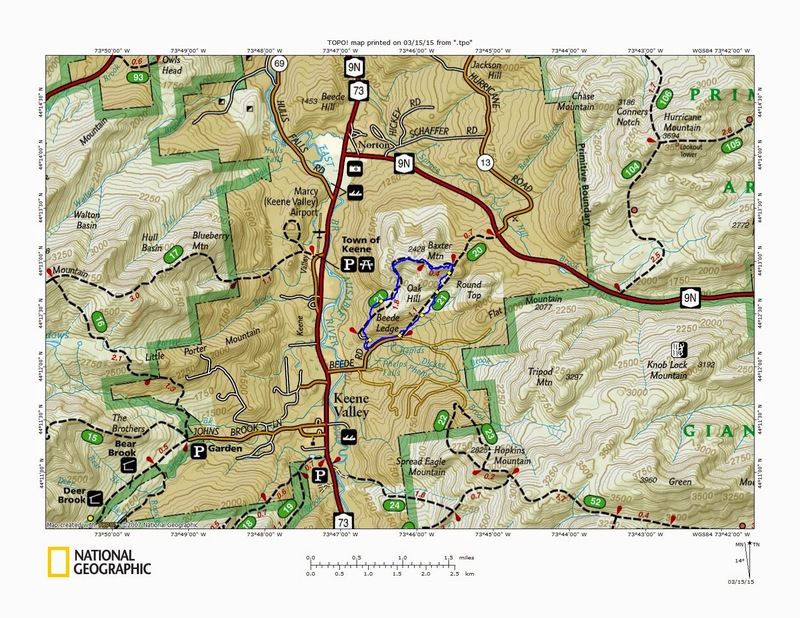 We thought this was a great loop trail (especially the Upham Road piece), but the trailhead should either be clearly marked so hikers can find it, and not trespass, or the trail should be removed from the map. There is no way to find the trailhead from a clockwise direction. Great hike over Baxter, I am surprised how thin the snow cover is. I take that hike at least once a week in summer and usually go clockwise starting up over Oak Hill. The Beede Ledges trail parallels Beede Lane and goes over several out crops and near another house on the right at the top of the hill. I was standing on one of the ledges about 25' above the trail when a coyote trotted right past, never saw me. That was in 2013. From the ledges you can bushwack toward Oak Hill and meet the yellow trail going up. Thanks for the information. Is there a good view anywhere on the Beede Ledges? Have you been over to Round Top as well? That looks like an interesting summit? From the recordings on AllTrails (http://www.alltrails.com/trail/us/new-york/baxter-mountain) it seems that everyone stops before the summit when ascending from 9N. Is the spot where the blue trail meets the yellow trail (with the worn top and bottom signs) the true summit? Yes I believe the true summit was very close to the intersection of the blue and yellow trails at the weathered sign.